Michael J. New, Ph.D. | June 23, 2015. This summer many people are anticipating the Supreme Court’s ruling in King v. Burwell. This case deals with whether health care exchange plans that are created by the federal government are eligible for federal tax subsidies. Right now the federal government is effectively running exchanges in about 34 states, a third of which allow the participation of insurance plans with elective abortion coverage. The ruling in this case has important implications for pro-life public policy. One major objection that pro-lifers had to the Affordable Care Act (ACA) was that it included taxpayer subsidies for exchange-based insurance plans that cover abortion. Receiving far less attention, however, is another aspect of the ACA that has the potential to expand abortion just as dramatically. Namely, the ACA includes very generous subsidies for states to expand their Medicaid programs. In National Federation of Independent Business v. Sebelius the U.S. Supreme Court ruled that the federal government could not use the prospect of losing current Medicaid funding to induce the states to expand their Medicaid programs. However, approximately 29 states have accepted federal subsidies without the threat of penalty and expanded Medicaid on their own. The concern pro-lifers have with Medicaid expansion is that 17 states use tax dollars to fund elective abortion through Medicaid. There is plenty of research which shows that subsidizing abortion through Medicaid increases abortion rates. Expanding the number of women of childbearing age eligible for Medicaid would doubtlessly increase abortion numbers even more. There are other concerns pro-lifers have. In some states, low-income women who are otherwise childless are covered by Medicaid only if they are pregnant. This creates an incentive for many women to carry their pregnancy to term. However, if all low-income women are covered and remain covered after an abortion is paid for — the incentive to carry a pregnancy to term disappears. Overall, abortion numbers have been consistently declining for decades. However, in states that fund abortion through Medicaid a Charlotte Lozier Institute review of the data shows that the percentage of total abortions in those states that are publicly funded has increased dramatically. 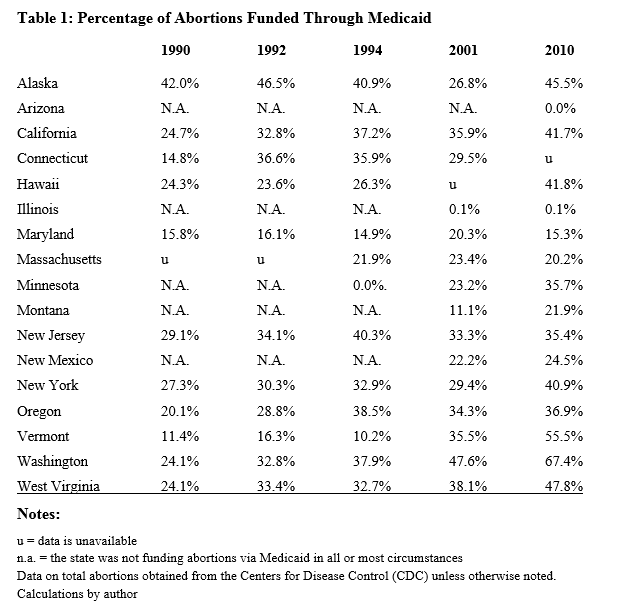 For instance, in 1990 only 24 percent of total abortions performed in Washington state were funded by Medicaid. By 2010 that figure increased to over 67 percent. Similarly, in 1990 only 11 percent of all abortions performed in Vermont were funded by Medicaid. By 2010 that figured had reached 55 percent. Continued Medicaid expansion has the potential to undermine a great deal of pro-life progress and thrusts taxpayers into a position of being majority shareholders in the abortion industry of these states.